October 2009 was undoubtedly the best month of my life so far. Back in this September blog post I listed a bunch of goals to take my life up a notch. A month later, I'm making big strides on at least three or four of them. Some of them won't kick into high gear until January, but it looks like it will be all systems go, so that's really great. Work has been going pretty well. We're finishing up a release and also knee deep in code for the next major release. My team had a strong demo for our second phase ("sprint") and although we're behind on our estimates, we've delivered enough working code to keep most folks optimistic I think. Also on the work front I attended about half of the developer day they had in town, which was pretty amusing and informative. The really interesting part was it was held at the offices of a tech startup incubater company call Tech Stars. I didn't know there was enough activity locally to have such a thing, but I guess there is, so that's encouraging. Also on the same day I ran about 13 blocks in the snow to attend part of a Python Unconference at the Google Boulder office. They have a rock climbing wall in the freaking lobby for Christ's sake. There was a cool vibe in there and it was clear that lots of the folks in the room were smart and technically sharp. I also got to meet and hang out with Bruce Eckel, who has some widely used books on computer programming out there and (including my first ever computer programming text book Thinking In Java) and a very popular blog that I enjoy. Plus, he's a burner. In terms of fitness, I hit two personal bests. I wanted to also add a third personal best run, but it didn't fit into the month, partially due to 24" of snow. But I swam 65 laps in a 25 meter pool and climbed a 5.11a route, so things are going well there. I deepend my yoga practice, as they would say, up to four or five sessions a week. That has been working really well. I enjoy my little yoga room I have set up and the consistency has made noticeable improvements to a few poses and my balance in general. I also got in one or two good mountain bike rides as the warm weather and evening sun were fading into winter, which I enjoyed a lot. I biked with a big group up around Dowdy Draw and Spring Brook loop, which was September 30 so technically not this month, but close enough. On the music front, as previously blogged, I heard the Kronos Quartet perform early in the month. Also this month on the music scene was a very good Galactic show at the Fox Theater. I didn't know this ahead of time, but Stanton Moore is their drummer. He's a great funk drummer and I have some of his stuff as a leader and sideman, so it was a bonus treat to unexpectedly hear him live. He did a big solo where he took his snare drum off the stand and went up to the front of the stage, which, although gimmicky, was still pretty funky. It was fun to have Erin there too contributing her sarcastic remarks occasionally. The main area of awesomeness this month was the social scene. I went with Erin to a family party since she's got three family members that are all pregnant now. I did a CHAOS full moon hike with Mags, which was really pleasant (another one coming up tomorrow night). I met a really sweet and fun new friend named Michale and hung out with her quite a lot. We had tea and watched lots of Six Feet Under and had some yummy meals. I hosted a CHAOS pot luck that was pretty well attended and seemed to do a good job of introducing seven or eight new folks to the group. I also hosted the first YouFilmFest party where I asked some friends to choose a few favorite youtube videos and then we hung out and watched them all including introductory comments. It went over very well I think and I think most folks will come back for the second one, which I'll probably plan for sometime in January. Michale and I went to Elise and Josh's for a fall festival party where we played Apples To Apples (well, everyone else played while I protested and grumbled about what a terrible pathetic game that is) and Cranium (yay). Josh melted some caramel and we dipped apple slices in it. Yum. Also had a few good family visits. Cousin Dr. Annie and her boyfriend Ryan flew in from Chicago and we had dinner with them, which was nice. Uncle Eddie came out for a visit which included a stop for dinner at my house and lunch at Lucile's this afternoon. I'm writing this post from Eben G. Fine Park in gorgeous sunny 60 degree weather while Eddie reads his New York Times. Halloween was a big deal this year. Jennifer and I researched some awesome costumes and had a fun evening a week or so ago driving around to costume stores, hobby stores, and Home Depot to get everything we needed. She ordered a few new items and I had some essentials shipped out from NJ. 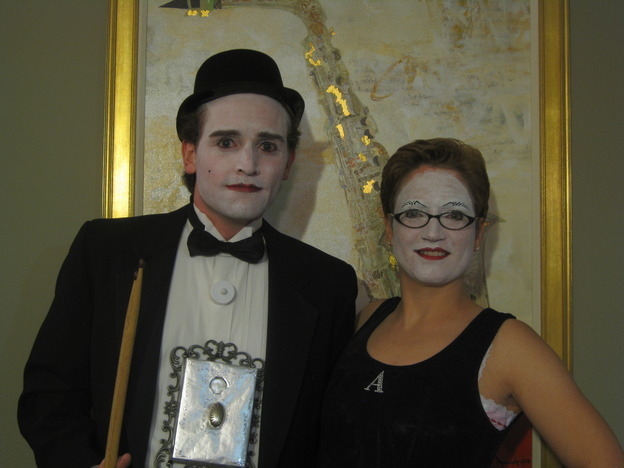 We dressed as the music group The Dresden Dolls in their costumes from the video Coin Operated Boy. The costumes, when all put together worked great. Next time we'll opt for a higher end white face paint since the cheap stuff doesn't look properly opaque and smooth. We went to a party in Denver where we were mistaken for Charlie Chaplin, Marcel Marceau or generic mimes. Although I think two people knew of the band when we told them. We gave out little candies with the description so people could google it later if they liked. **More Halloween photos are here **. I also had some fun home improvements this month. I hung a Metolius Slim Gym rock climbing exercise board over the door frame in my office. I've been enjoying working on pull-ups while gripping the slopers instead of a nice bar. I hoping to get some other cool equipment hung in my basement similar to what they have at The Spot. I hung the great big saxophone painting that my parents bought for me and kept in their house until I got my own place. You can see it behind the Halloweeen photos . So yeah. It's pretty cool to be sure you've just lived your best month yet. There was one minor bummer. I chipped a tooth (ironically while flossing) last Thursday and had to spend two and a half hours in the dentist chair getting a crown early Saturday morning, but overall it wasn't too bad. Oh, and my lawn sprinkler exploded two hours before the guy showed up to winterize it, but that was just a minor busted part. I'm looking forward to a trip to Cupertino for work and a long trip back to NJ over Thanksgiving next month. Plus a live Imogen Heap show!